Forward Sondre Olden, a third-round draft choice of the Toronto Maple Leafs in June, highlights a list of 24 players on the preliminary camp roster for the Norwegian National Junior Team that will compete at the 2011 IIHF World Junior Championship in Buffalo, N.Y.
Norway's first game in the preliminary round is Dec. 26 against Sweden. The Leafs selected Olden of Modo's junior team with the 79th choice after sending the Los Angeles Kings a third-round pick in 2012 for the right to select him. A product of Norway, Olden made the move to Sweden's junior league in 2009-10, jumping from Sweden's Under-18 division to the Under-20 as a 17-year-old. Norway traditionally is not a producer of NHL players— only five Norwegians have ever made the NHL. Olden hopes to be the sixth. Norway’s roster also includes three forwards currently playing in North America. Rasmus Juell of the Cedar Rapids RoughRiders in the United States Hockey League, Andreas Stene of the Kelowna Rockets in the Western Hockey League and Nicholas Weberg of Shattuck-St. Mary's Prep in Minnesota. Juell joined Cedar Rapids just before the start of the 2010-11 season. 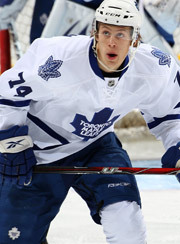 He played midget hockey for Belle Tire in Detroit in 2007-08 and spent the past two seasons playing in Sweden. He's committed to play at Northeastern University. "I'm very excited. I like smaller rinks like (this)," Juell said on the prospects of playing in Buffalo. "I think the hockey is more fun to play here than in Europe." Goalies -- Kenneth Eriksen, Manglerud Star (2011 Draft eligible); Steffen Soberg, Manglerud Star (2011 Draft eligible); Lars Volden, Espoo Blues, Finland (2011 Draft eligible). Defense -- Robin Andersen, Stjernen (2011 Draft eligible); Jens Ulrik Bacher, Frisk Asker (2011 Draft eligible); Nicolay Bryhnisveen, Lorenskog (2011 Draft eligible); Adrian Saxrud Danielsen, Storhamar (2011 Draft eligible); Kenneth Madso, Lillehammer (2011 Draft eligible); Daniel Rokseth, Manglerud Star (2011 Draft eligible); Tobias Skaarberg, Sparta Sarpsborg (2011 Draft eligible). Forwards -- Simen Viker Brekke, Valerenga (2011 Draft eligible); Eirik Borresen, Storhamar (201 Draft eligible); Petter Roste Fossen, Rosenborg (2011 Draft eligible); Hans Kristian Hollstedt, Stjernen (2011 Draft eligible); Michael Haga, Lulea, Sweden (2011 Draft eligible); Rasmus Juell, Cedar Rapids RoughRiders, USHL (2011 Draft eligible); Magnus Lindahl, Frisk Asker (2011 Draft eligible); Torstein Nordrum, Frisk Asker (2011 Draft eligible); Sondre Olden, MODO, Sweden (Toronto); Mats Rosseli Olsen, Valerenga (2011 Draft eligible); Jonas Oppoyen, Valerenga (2011 Draft eligible); Andreas Stene, Kelowna Rockets, WHL (2011 Draft eligible); Joachim Sundelius, Manglerud Star (2011 Draft eligible); Nicholas Weberg, Shattuck-St. Mary's (High-Minnesota) (2011 Draft eligible).